Diffusion-weighted imaging (DWI) is based on principle of Brownian movement of water molecules, a microscopic random motion of the water molecule protons across cell membranes, a physiological phenomenon. The diffusion of water molecules in brain tissue like other tissues, is guarded by biologic barriers like cell membranes and cellular organelles, which are blessed with sodium/potassium pumps for this. The quantification of this diffusion is known as the apparent diffusion coefficient (ADC), and is done by this type of imaging. - Acute and sub acute ischemic stroke - Usually takes 7-14 days for hyperintensity to subside. - Trauma, Diffuse Axonal Injury. - Acute demyelination, Marchiafava Bignami disease. - Encephalitis – Herpes, CJD, Influenza like encephalitis. - Focal cerebritis, Ac cerebellitis, Brain Abscess and Empyema. - Thrombus dural venous sinuses. - Near mastoid and roof of orbit, an Air-bone interface artefact. In ischemic insult, altered intra celluar energy metabolism results in sodium/potassium pump failure which in turn affect intracellular and extracellular water molecule movement and is the presumed explanation for cytotoxic odema, result in increase in brain tissue water in the region of infarct. Occurs within minutes of the onset of ischemia. When magnetic field is applied, the water molecules move in the direction of the magnetic field gradient; these water protons accumulate a phase shift in their transverse magnetization relative to that of a stationary one, and this phase shift is directly related to the signal attenuation of the image. Provides image contrast that is different from that provided by conventional MR techniques. Region of ischemia appears intensely bright described as an area of restricted diffusion and is confined to particular vascular territory involved. In trauma, rotational acceleration and deceleration forces produces shear-strain in brain tissue common sites are gray-white junction, corpus callosum and mid brain. Altered calcium and potassium homeostasis, release of excitotoxic amino acids ,free radicals, and tissue acidosis affects ADC values. Other possible explanation is presence of microscopic hemorrhage and ruptured axons with membrane fragmentations, increasing the barriers to the free movement of water molecules. In brain abscess, bright signal at the periphery or at core is secondary to increased viscosity of pus which in addition contains large molecules such as fibrinogen that bind with water molecules and add to the effect of restricted diffusion. In bleed, the appearance of bleed on Dw images is complex and is affected by many factors, including age of hematoma, relative amounts of different hemorrhagic products and the pulse sequence used. Oxyhemoglobin and Extracellular methemoglobin are bright on diffusion. Oxyhemoglobin is hyperintense on DW images due to relative restriction of water movement inside the red blood cell. Extracellular methemoglobin has a higher ADC than does normal brain tissue, indicates high mobility of water molecules in the extracellular space. This prolongation of the T2 component of fluid with extracellular methemoglobin results in hyperintensity on DW images. Hemorrhage containing deoxyhemoglobin, intracellular methemoglobin, and hemosiderin are hypointense on DW as well as T2w images because of magnetic susceptibility effects. 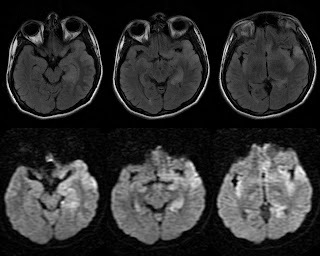 In demyelination, Multiple sclerosis and Acute disseminated encephalomyelitis; Acute plaques have significantly higher ADCs, this elevated diffusion result from an increase in the size of the extracellular space due to edema and demyelination. In rare instances, acute plaques have restricted diffusion may result from increased inflammatory cellular infiltration with extracellular odema. In Hypoglycemic Encephalopathy, splenium of corpus calloum and bilateral posterior limb of internal capsules are the commonly affected areas. Pathogenetic mechanisms for diffusion restriction in HE include energy failure, excitotoxic edema, and asymmetric cerebral blood flow. Glucose deprivation leads to arrest of protein synthesis, incomplete energy failure and loss of ion homeostasis, cellular calcium influx and intracellular alkalosis. 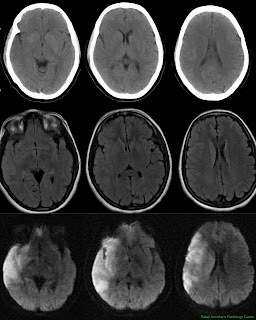 Excitotoxic edema in contrast to cytotoxic edema, does not imply neuronal damage, this is the reason signal changes on MRI diffusion in HE are usually transitory and completely reversible after glucose infusion. • Ischemia: A major clinical implication of Dw imaging is in acute ischemic stroke, a most important sequence in stroke protocols. Fast, because Dw imaging uses fast echo-planar technique, it is highly resistant to patient motion and imaging time ranges from a few seconds to 2 minutes suits the situation. Most easy sequence to interpret, as its provides image contrast that is different from that provided by conventional MR techniques. Ischemic area with restricted diffusion seen white area stands out over the adjacent normal non ischemic parenchyma. Most sensitive for acute ischemia, restricted diffusion associated with acute ischemia has been detected as early as 30 minutes after a witnessed ictus making Dwi very sensitive and relatively specific. 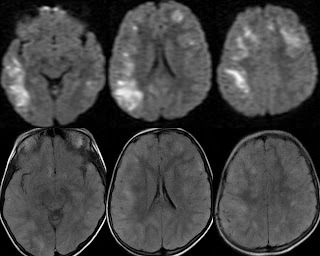 The detection of ischemia as hypo attenuation on CT scans and hyperintensity on T2-weighted MR images requires a substantial increase in tissue water. Dw imaging is totally based on different principle which occurs within minutes of the onset of ischemia. 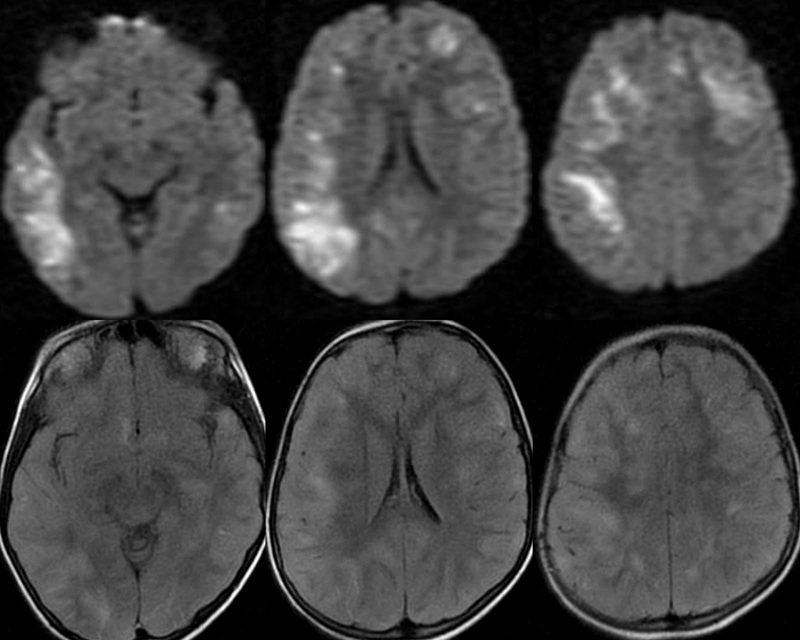 For infarctions imaged within 24 hours, reported a sensitivity of 58% for CT and 82% for MR imaging. For the detection of hyperacute and acute infarctions, with a sensitivity of 88%–100% and a specificity of 86%–100%. 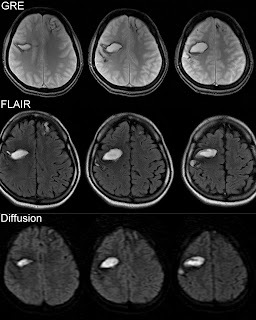 FLAIR – Diffusion mismatch, if an infarct is seen on diffusion and not seen on FLAIR interpretated as FLAIR – Diffusion mismatch indicate salvageable tissue or tissue at risk. 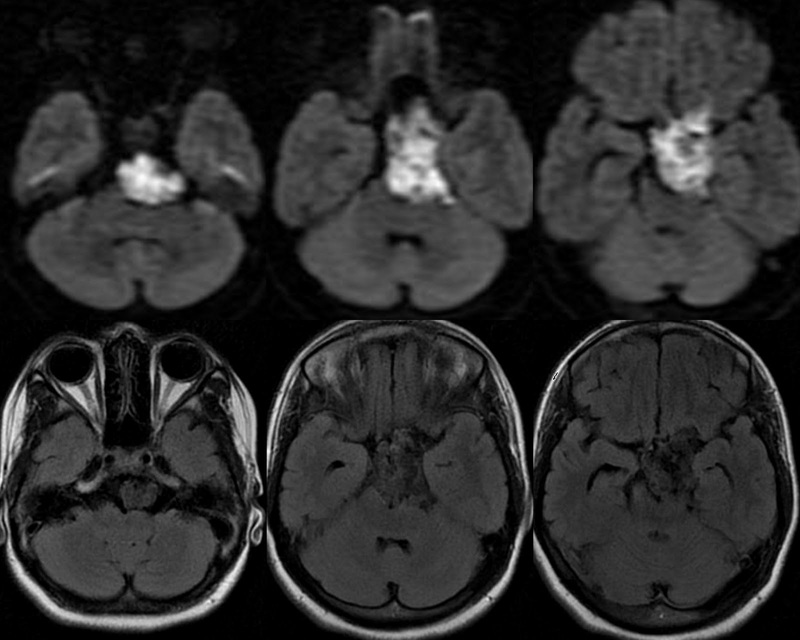 Acute on Chronic infarcts, on T2 images both appear bright. Foci of recent ischemia obscured in the background of marked focal cytotoxic odema of relatively older infarcts. In that case foci of recent ischemia characterised by restricted diffusion stands out on the background of rest of the T2 hyper intensity without restricted diffusion. 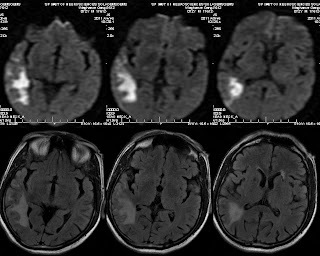 Transient ischemic attacks, nearly 50% of patients with transient ischemic attacks have lesions characterized by restricted diffusion; lesions usually are smaller less than 1cm. 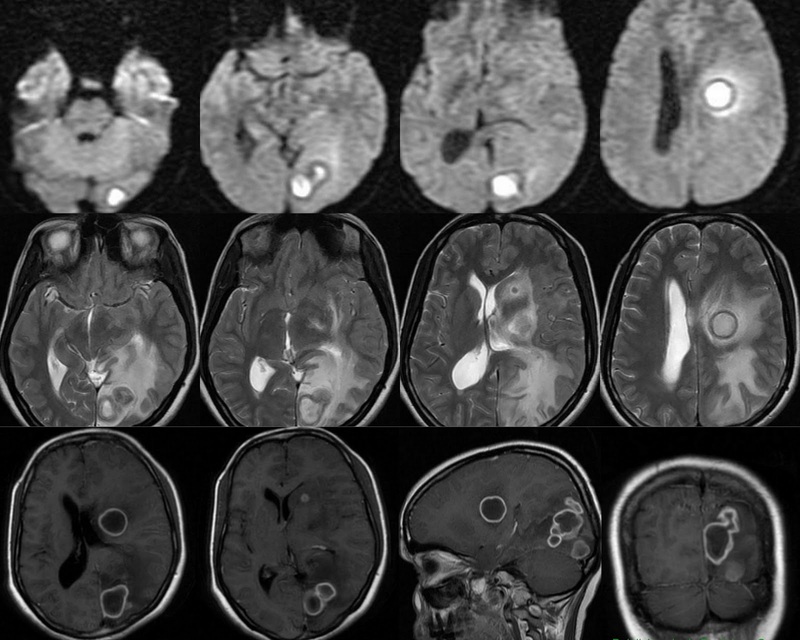 > Trauma: to rule out DAI in patient with normal CT brain with poor glass glow coma scale. 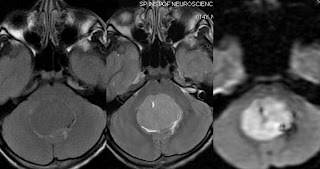 > Epidermoid vs Arachnoid cyst: Both follow near same signal on conventional sequences. 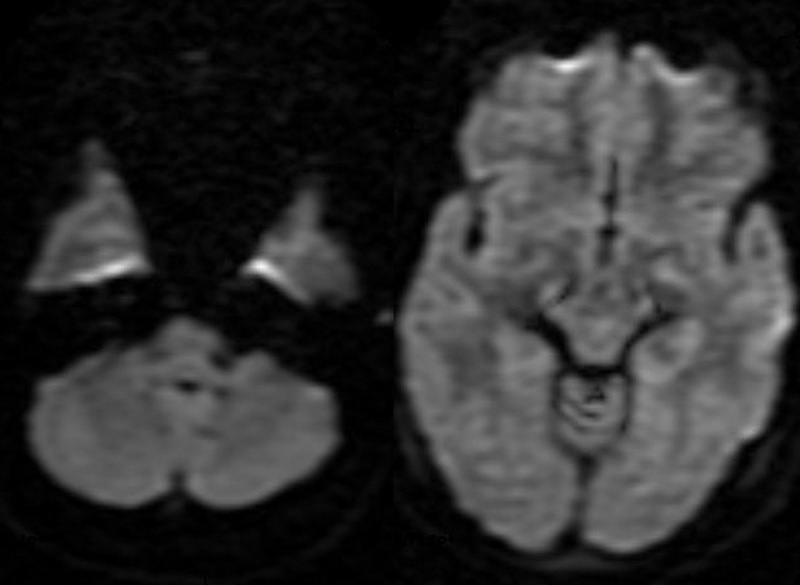 Restricted diffusion is a characteristic of Epidermoid and rules out Arachnoid. > Posterior Reversible Encehalopathy Vs ischemia : Ischemia in the territory of posterior circulation or along posterior cortical border zone is closest differential for PRESS. Absence of restricted diffusion is very typical of PRESS. > Cholestatoma: show typical restricted diffusion in the back ground of T2 hyper intense CSOM and mastoiditis. 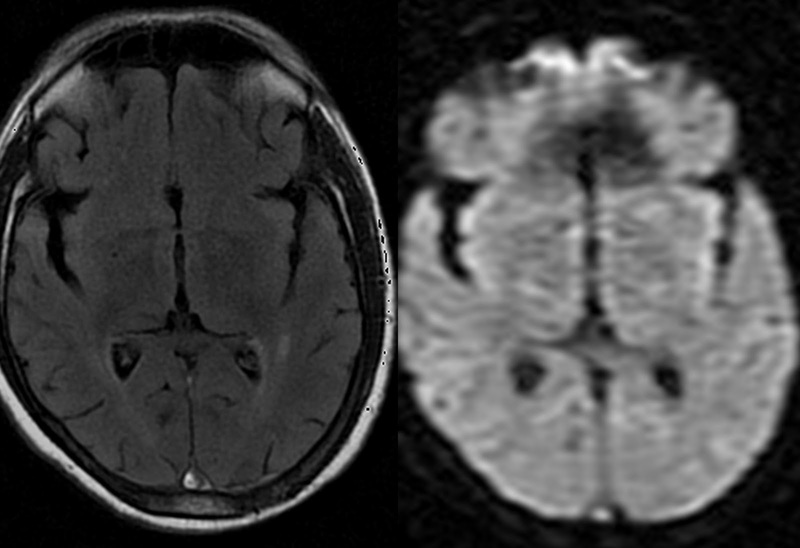 > Encephalitis : Herpes, show restricted diffusion with bilateral asymmetrical involvement of Mesial temporal lobes. CJD, characterized by atrophy with insular and cingulate gyral involvement. 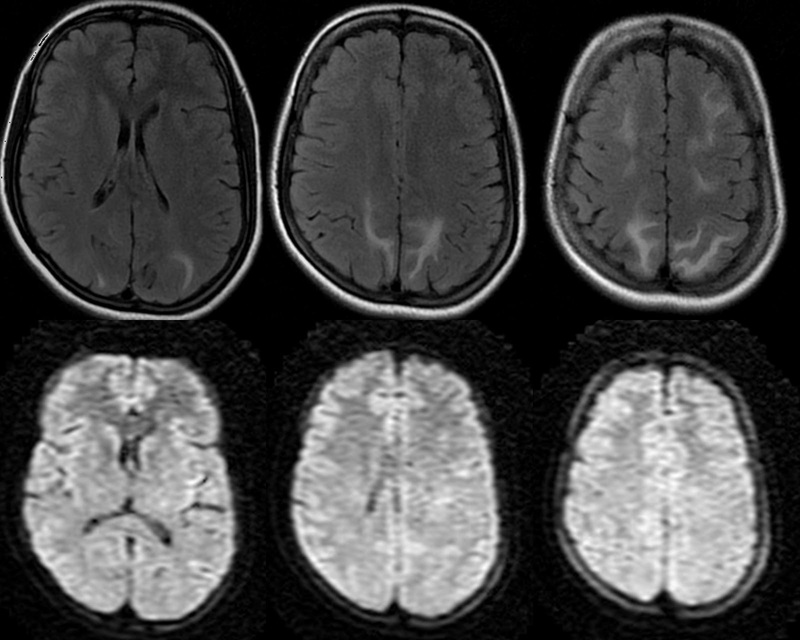 Influenza like encephalitis, show restricted diffusion common in splenium of corpus callosum. 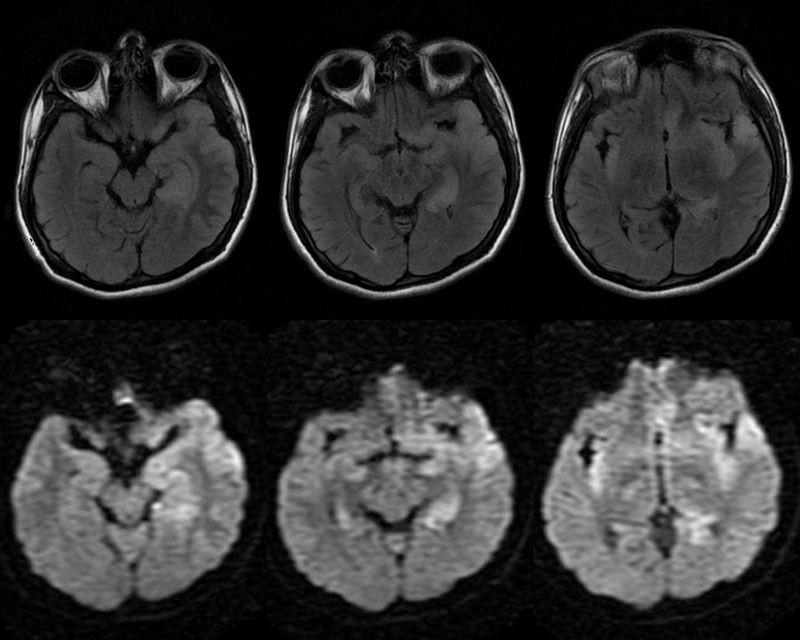 > Marchiafava bignami disease in chronic alcoholics show restricted diffusion splenium of corpus callosum. 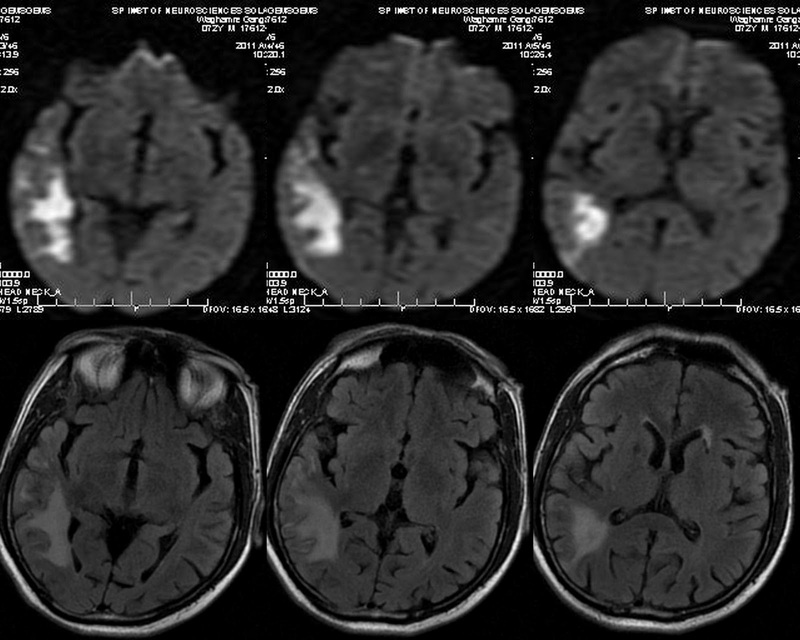 > Abscess vs Glioma. 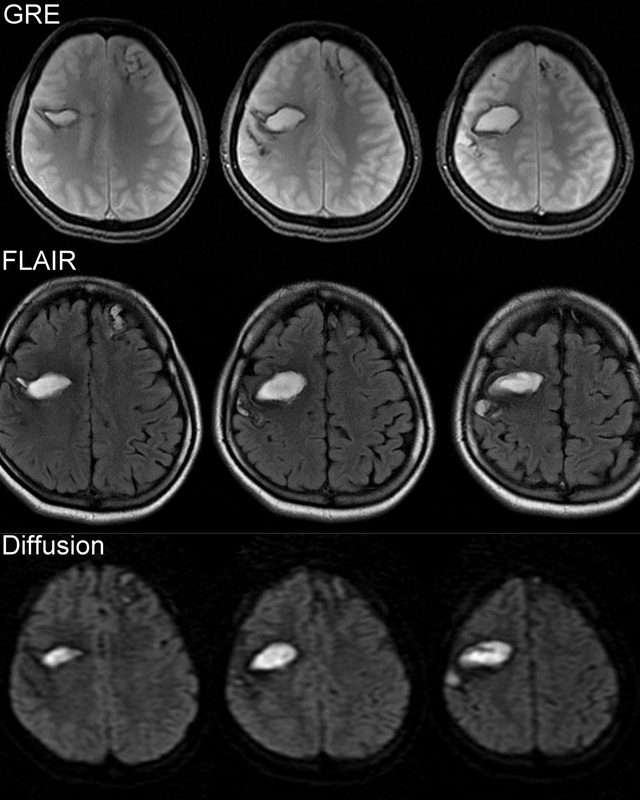 Restricted diffusion along its wall or core is more common in abscess than glioma. > Empyema vs subdural effusions: Empyema is characterized by restricted diffusion. > AEDs: A transient restricted diffusion in splenium of corpus callosum in pts on long Anti Epileptic Drugs, a debatable issue that whether its drug induced toxicity and demyelination or a reversible post ictal change. Certain studies hav reported this transient finding reversing on discontinuation of drugs. 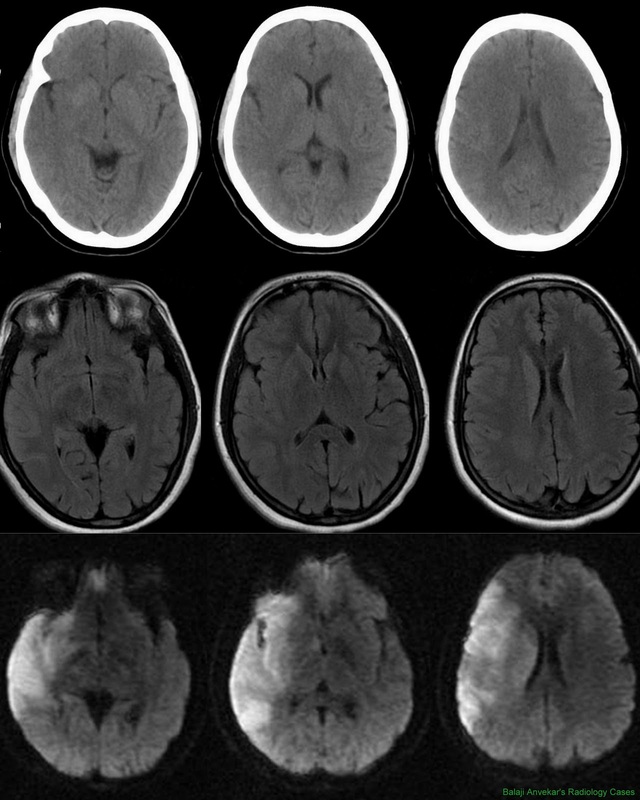 > Hypoglycemic Encephalopathy : Role of MRI Brain Diffusion in HE to evaluate topographic distribution of signal abnormality of hypoglycaemia which decides severity and prognosis of HE. 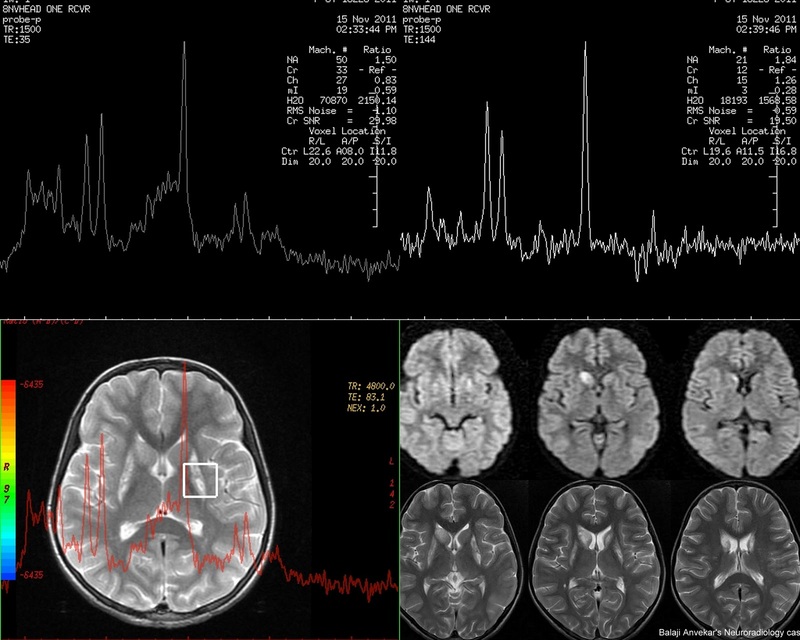 If signal abnormality is confined to WM such as the CC, IC, or CR and the signal abnormality regresses on follow-up imaging carries good recovery without a neurologic deficit. If lesions are detected in the cerebral cortex, BG, or hippocampus and the lesions do not regress on follow up imaging is associated with poor outcome. CT study of Brain shows faint low attenuation involving right insular cortex and adjacent basal ganglia - insular ribbon sign. Faint T2 hyperintensity seen on FLAIR. DW images show an obvious infarct with restricted diffusion, seems to be an acute infarct as changes are not marked on FLAIR and CT study. Area of involvement is larger on Dw compared to FLAIR, a FLAIR - Diffusion Mismatch. 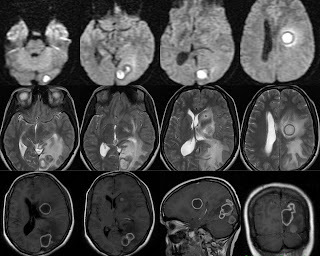 A pt with h/o RTA, brought unconscious, on admission CT nearly normal except mild subjective diffuse cerebral odema. MRI Diffusion show restricted diffusion in corpus callosum an example of axonal injury and typical for site. 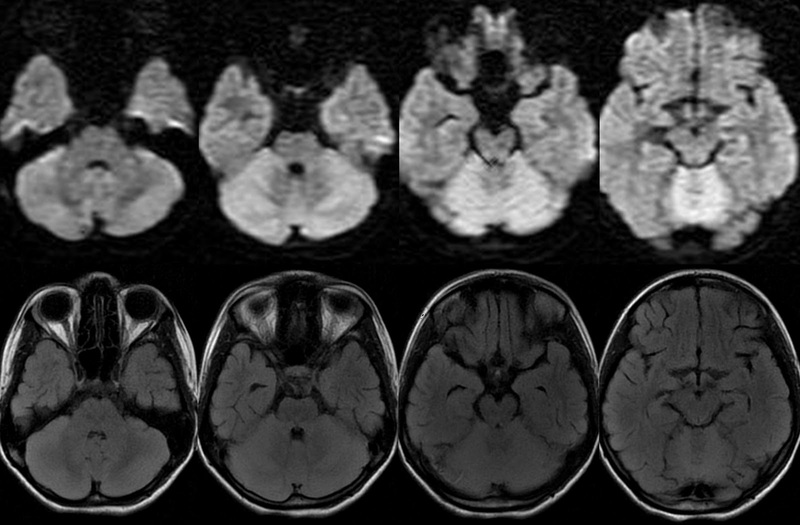 Tumefactive Demyelination; A known case of demyelination responding well to steroid. Skipped doses for some other reason. A Epidermoid cyst in prepontine cistern with typical restricted diffusion, rules out Arachnoid cyst. Posterior Reversible Encephalopathy, Bilateral asymmetrical involvement of parieto occipital cortex, T2 hyperintensity without restricted diffusion. 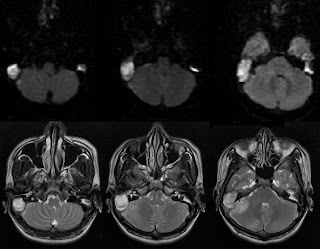 Herpes encephalitis with bilateral asymmetrical involvement of mesial temporal lobes and adjacent insular cortex with restricted diffusion on dw images. 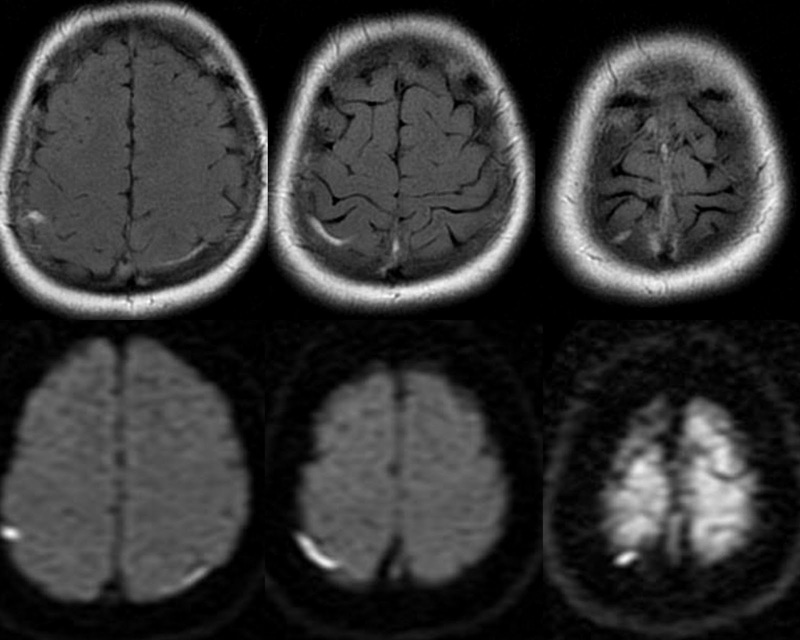 CJD, A 30 yo female with progressive dementia and altered cognition. 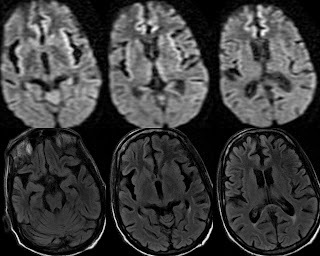 MRI show diffuse cerebral cortical atrophy significant for age with restricted diffusion involving cigulate gyri and insular cortex. 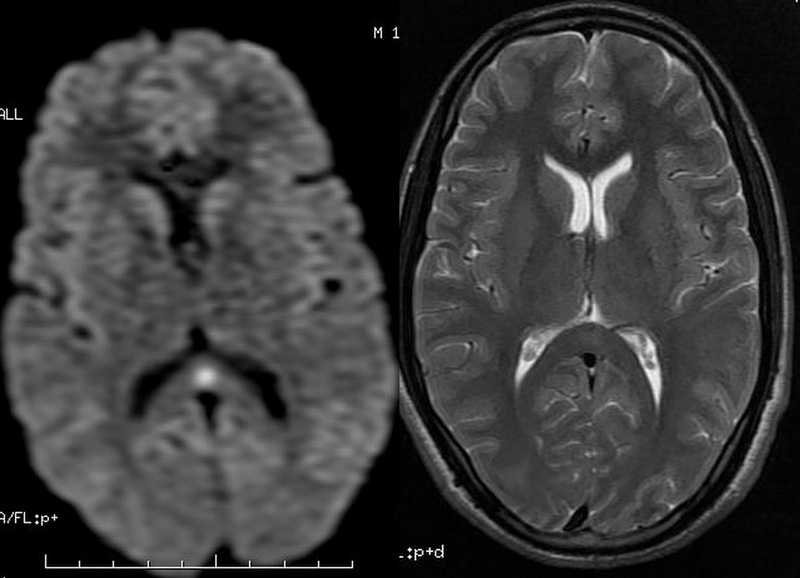 Encephalitis, a 13yo male brought unconscious, history of low grade fever since 3 days. 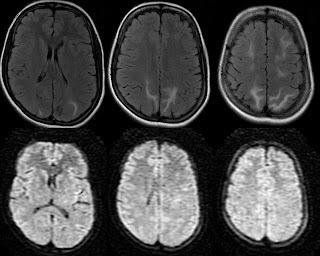 On admission MRI show restricted diffusion in splenium of corpus callosum consistent with viral (influenza like) encephalitis further supported by Csf examination. Focal cerebritis / Encephalitis; bilateral asymmetrical involvement, fronto parietal cortical restricted diffusion with T2 hyperintensity and focal parenchymal swelling. Acute cerebellitis, a young male with history mild fever since last 3days, now complaining of giddiness. On neurological examination revealed profund ataxia. Tubercular Abscess with restricted diffusion and multilocular peripheral enhancement, peri lesional odema. 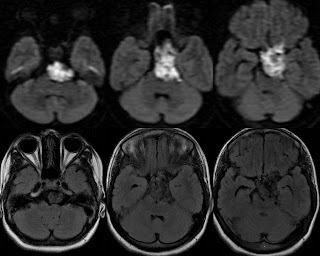 Sub dural empyema with restricted diffusion. A known case of bilateral mastoiditis. Pt on AEDs, a known case of GTCS under treatment of anti epileptic drugs. Conscious and well oriented came for routine follow up MRI screening show a focal restricted diffusion in splenium of corpus callosum. rest of the brain parenchyma unremarkable. A thrombus in cortical vein showing bright signal on diffusion. 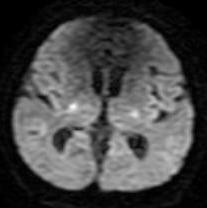 A thrombus in superior sagittal sinus showing bright signal on diffusion. Bilateral high signal near mastoid and roof of orbit is artifactual due to Air bone inter phase. An Olfactory groove meningioma, bright on diffusion implies to atypical variety of meningioma. 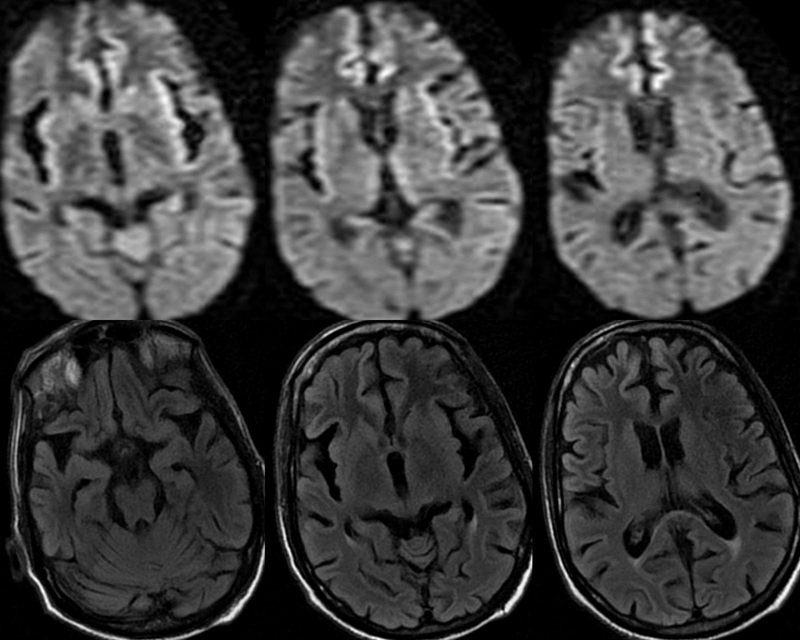 A 55 yo male brought to casualty with focal neuro deficit period. MRI Brain Diffusion shows Restricted Diffusion along posterior limb of bilateral internal capsules with Blood sugar level 45 mg/dL suggestive of Hypoglycemia induced reversible signal abnormality on MRI diffusion. HE known to present with focal neurological deficit and may mimic stroke. Conclusion: Apart from infarct there are many other conditions and lesions which are bright on diffusion. In infarct restricted diffusion is the exact mechanism behind brightness on dw images where as in other lesions cellularity, compact arrangement of cells, protein content and water binding property contributes to brightness on diffusion. So the more accurate way in such cases is just describe the high signal intensity of such region or lesion instead of using term restricted diffusion. Thanks for your post. Intereting and helpful! Excellent compilation of cases and cases of diffusion restriction.